Virgin Pina Colada Recipe is for all those who are into non-alcoholic cocktails, so-called mocktails. A refreshing tropical drink to get you into the vacation mood! What is a Virgin Pina Colada? The Virgin Pina Colada is a non-alcoholic cocktail variation of the popular alcoholic Pina Colada, which is prepared with pineapple and coconut milk. To get the most out of your virgin Pina Colada try to use only fresh ingredients to make a virgin pina colada from scratch. For example, juicing your own fresh pineapple and preparing your own coconut milk or coconut cream will make your non alcoholic pina colada all the more flavorful and interesting! Pineapple juice – using a real pineapple is all the better! For a pina colada mocktail without alcohol, just skip the idea of adding any alcohol. To achieve that is actually quite simple as you can see. Use a fresh whole pineapple and cut off the outer poky peal, discard the green top of the pineapple. Slice your pineapple. You have the option of cutting out the center of the pineapple, which can cause throat irritation. So, just cut out the center in a circle (as you would see in the canned pineapple slices). Add the pineapple to a blender jar and create a smooth paste. You can add some water while blending the pineapple smooth. This can dilute the pineapple juice as well but assists you in creating a juice quickly. Then, you just need to press the pineapple paste through a sieve so that the pineapple juice falls into a bowl below. You can also prepare the coconut milk from scratch easily with the same blender paste and sieve method. Then combine the ingredients as explained further. Combine the pineapple juice, coconut milk and crushed ice to a virgin pina colada, either shake with crushed ice in a shaker or take to the blender and just blende smooth. I usually like to serve the non-alcoholic Pina Colada in a tall glass but recently I have been enjoying them simply in mason jars. Pina Coladas are great for children too so serving them up in mason jars is, I think, a smart idea. You can decorate the pina colada with pineapple chunks or cut white hard coconut flesh pieces. A straw is usually a must as well and some folks like the virgin pina colada with small cut pineapple chunks over the pina colada mocktail. Mason Jar Glass set so that you can enjoy virgin pina coladas with the whole family. Kids can grip those glasses. Mason Jar lids with Straws to keep everything hygienic. 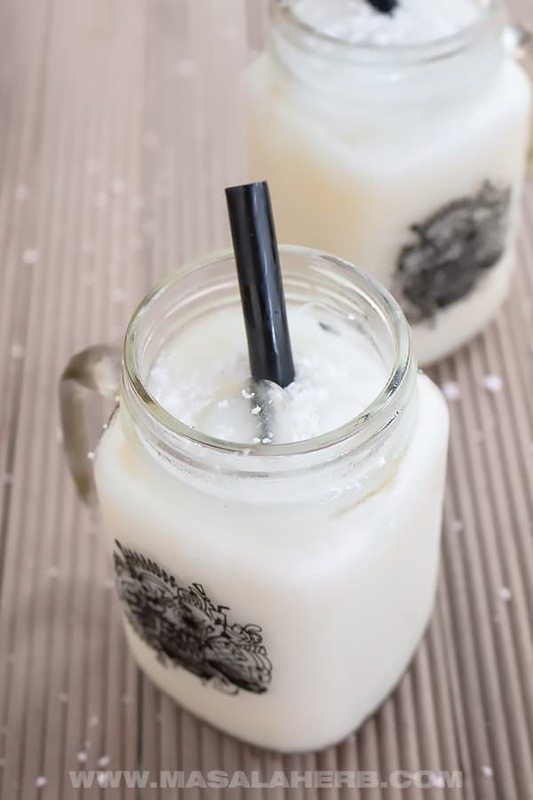 This is a virgin pina colada with coconut milk but you can easily switch the coconut milk with coconut cream and or add ice cream, coconut water or even coconut milk powder to add some thickness. For more details how to make pina colada without alcohol see the full post with tips and options. In a shaker or blender mix all the mocktail ingredients so that the virgin pina colada is smooth. The mocktail should be creamy in consistency due to the coconut milk in the drink without alcohol. You can use crushed ice or ice cubes as well. Crushed ice turns the virgin cocktail thicker. Use ice cubes if you are planning to blend the pina colada instead of shaking it in the mixer. 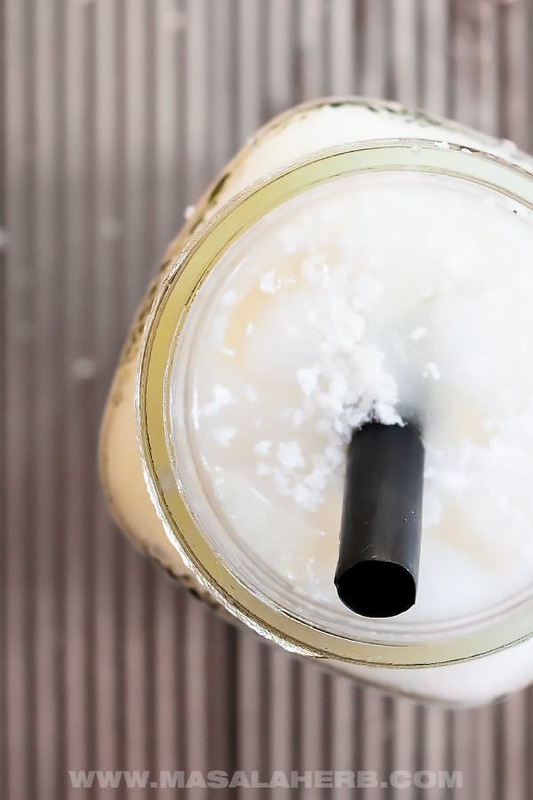 Serve in Mason Jars so that the kids can enjoy the Virgin Pina Colada as well. You can adjust this virgin pina colada recipe by adding ice cream, coconut cream, coconut water, sugar or coconut milk powder. 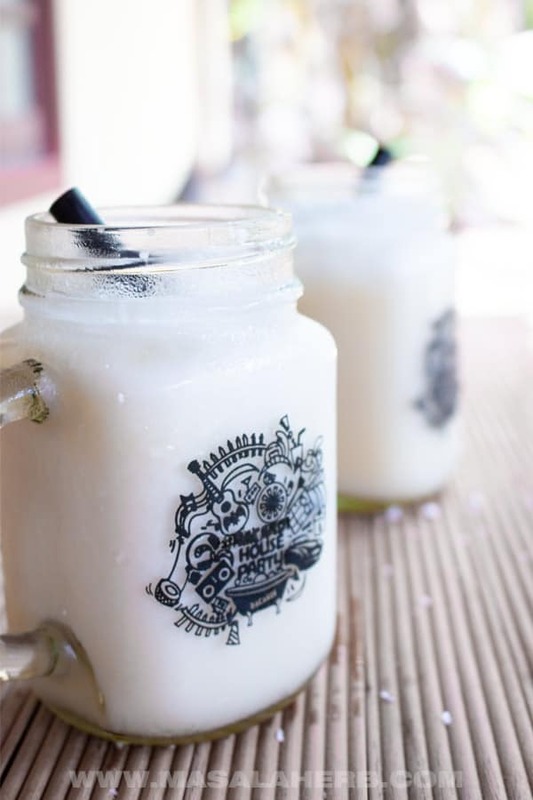 You can use light coconut milk too to reduce calories, however, this will result in a more liquid consistency. Coconut milk powder can thicken the alcohol-free beverage but I can't confirm the calories added to coconut milk powder. To make the pina colada mocktail from scratch please see instructions in the post further up. Dear Reader, what ingredients are you intending to add to your virgin pina colada recipe? Please feel free to share your thoughts and ideas with us further below in the comment section. Hi, this may be interesting you: Virgin Pina Colada Recipe!